Eggstravaganza has been a family favorite for years. Callanwolde celebrates the coming of spring with its annual Easter egg hunt to be held Saturday, March 30, 2013, from 10:00 am until 12:00 noon. 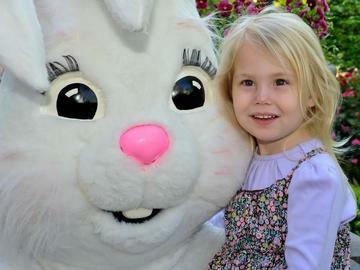 Eggstravaganza features thousands of candy-filled eggs to find (including three golden “prize” eggs), Atlanta Braves games & prizes, and a chance to meet the Easter Bunny. There will be baked goods for sale, a “cake walk”, face painting, carnival games, and spring-themed arts and crafts for kids. Bring your basket and your camera for a fun, family day amidst Callanwolde’s beautiful spring gardens and grounds. Tickets: Tickets may sell out. Avoid lines and save time – buy tickets online at TicketLeap.com. Arrive early for parking ($5 per car) and shuttle bus service beginning at 9:30 am at the Emory University Briarcliff Campus, 1256 Briarcliff Road, just one-half mile north of Callanwolde. No onsite parking available. In case of rain the event will be cancelled. For more information: 404-872-5338 or www.callanwolde.org. Ticket sales are non-refundable, non-transferable. They are considered donations to Callanwolde's Dance Department. Adults are asked to please stay off the field during the egg hunts. This is mandatory for the safety of the children. No on-site parking. Arrive early for parking ($5 per car) and shuttle bus service beginning at 9:30 am at the Emory University Briarcliff Campus, 1256 Briarcliff Road, just one-half mile north of Callanwolde. For more information call 404-872-5338.